It's a Rollator and a Transport Chair! The latest innovation from Drive Medical, the Duet Transport Chair & Rollator combines the features of a Transport Chair and a Rollator in one unique product. The individual can ambulate by themselves or be pushed by a caregiver. The foot rest folds down when used as a Transport Chair and folds up and out of the way when used as a Rollator. The Duet is comfortable and easy to use. Comfortable padded seat with a large underseat pouch for safe storage of personal items. Inside the pouch is a handle to aid with the folding. 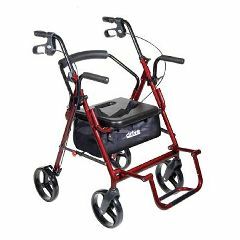 Combines the features of a rollator and transport chair in one unit. An individual can ambulate independently or be pushed safely by a care giver. The Duet has locking flip up armrests and a flip down footrest to aid the user while the Duet is used in the transport chair mode. A safety lock release is used to store the arms and a hook-and-loop fastener(s) strap is used to store the footrest while using the Duet for ambulation. Easy To Use. Safe. Supports Weight. Well Constructed. This product is a life-saver (possibly in the literal sense). My 88 year old grandfather is able to walk with assistance almost all of the time, but when he needs help, he really needs to be able to sit and be pushed to his destination. He just could not understand why that was not an option with our previous walker (whose wheel snapped off, dumping my grandfather on the ground, when he tried this with a relative who disregarded the instruction manual and the many dire warnings specifically prohibiting it). Now we have a great-looking, extremely sturdy and portable walker that also doubles as a perfectly safe and comfortable transport chair when it needs to be called into service as such. This is a fantastic product and I cannot recommend it highly enough. Thus far we have only used it indoors, but from the construction and the way it handles, I believe it will work just as well for short distances outdoors. Of course, there is no way I would go over large bumps or curbs or anything like that, but for getting to and from the car, this could be a great help. If you are in a situation similar to the one I have described, I think you might really benefit from the rollator/transfer chair combo. I am so glad we got one -- it is a huge relief to me, and I know that my grandfather feels a lot better knowing he has the option of riding if he doesn't feel up to walking. The hole in the seat to lift it is very uncomfortable when sitting on as a wheelchair. I see no need for the hole as I have a walker that does not have a hole and lifts very easy without the hole.I called DRIVE customer service to see if I could purchase a seat without the hole and was told they had nothing to replace it with. I would not have bought it if I had known wwhat I know now. Stores Easily. Easy To Use. Lightweight. Well Constructed. Supports Weight. Safe. Elderly. Long Term User. neuropathy. Wife. Wonderful -Handles are perfect heigh. Tried riding in older walker, nowhere to put feet. Now I can go anyplace someone can push me. It is easily stored. Easy to get around . Asked on Jul 17, 2012 6:45:01 PM by Jerry from Bellingham, Wash.
You call Allegro and they get it from the company for you.